This blog will be a little different, in that I found a poster that had some good advice about falling in love. So many times falling in love just happens and sometimes it is for all of the wrong reasons and hearts get broken. It is not always easy to follow any rules or guidelines of falling in love, however, there are topics to think about and discuss with your significant other before it becomes the drama that everyone wishes to avoid. fall in love with someone who believes in you! There are many ways that we can make our environment a more creative and inspirational place to work. First of all, I am speaking as a writer and artist from my own home, where I am in control of everything that surrounds me. This is much easier to do than if you were in a company's office environment. It is something that I have been working on for a while and will continue to revise things that I feel are not conducive to my creativity. The starting place is with your mindset. There needs to be an openness and acceptance so that creativity can flow freely. Always be appreciative of your daily gratitudes, which means writing them down and expressing them daily. Mindset is the key to the creative process. Flexibility and persistence are key factors to success before you even begin to work on the physical environment surrounding you. They help in your workflow. Know when it is time to continue to roll with the flow, when an idea is coming on strong from your brain to your fingertips. You have no set time. Your biological clock will set your working hours. Each person is different. For some people it is not even the same day to day. Find your own routine that works for you. Then if you are flowing freely with your creativity, you can keep going, just the same as you need to do when you are having a mind block. Use distractions to help you move on in your work instead of forcing it. Take a walk, watch a movie, read a book, meditate, etc. Once your mind is away from your work block, it will let you know when the time is right to return. Have a comfortable spot for your work environment. Comfort for me could be quite different from other writers or artists. At the start of my day and when I am finishing up, I like a clutter free environment. A comfortable desk and chair, plus a soft, cushy sofa to sink into so that I can read, edit or perhaps just close my eyes for a moment. Music, not TV, is a major player in my creative environment. The genre depends on what is going on with my writing, editing or painting. Soft jazz and easy listening, along with classical music works best for me. It is good to try different music so that you are aware how it affects your work. If you work better in the sounds of silence, then that is what works for you. For myself, it is important that I dress comfortably. There is a difference in dressing comfortably and just throwing on a sloppy sweatshirt and sweatpants. 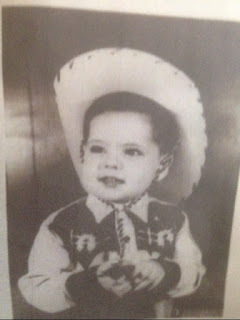 Dressing well has always been a big part of my working life. It boosts my self confidence of who I am. Nothing stiff and formal is required, just a happy medium. Because you are at home, you have control over the temperature that you are working with and your clothes may reflect how you dress based on how warm or cool you like to keep your home. Pick a day or two that you work from another location for a while. Coffee shops are filled with writers and their laptops. It is also a good place for networking. 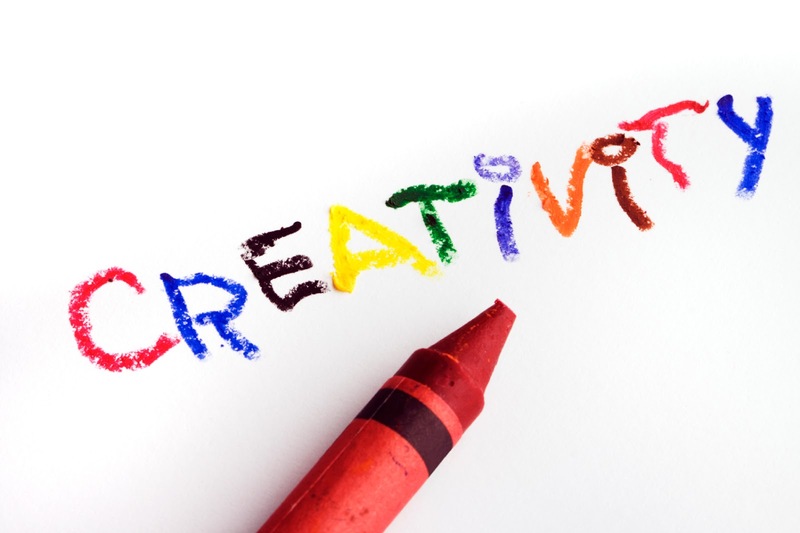 It can optimize your creativity and inspiration just by the very fact that you are with others who have taken that step out of a day to day work environment. Many times this requires one to leave their comfort zone. It is very important to not become a recluse. Make lunch dates or brunch dates or just meet for a cup of coffee with friends. Above all, keep flexibility in mind. You do need to understand your rhythms function and do what works best for you. Listen to your head and your body. If you need to be alone and in quiet solitude for a day here and there, then that is for you. Mix it up some and find what happens to your creative side when your environment changes. According to Peter F. Drucker, "If you want something new, you have to stop doing something old." We all have a lot of junk in the trunk, or the attic, or the basement, or the garage. It just accumulates. When it comes time for moving or giving yourself more space, it then hits you upside the head. The question then is why in the world did I hang on to this stuff? What purpose does it have? Now, I am not talking about valuable type collectibles such as Barbie dolls, vinyl records, comic books, etc. I am simply talking about old dishes, silverware, clothes that are no longer worn due to out of style and not fitting, pictures, pillows and other houseware items. Over the years these boxes pile up and we all have the tendency to say to ourselves that one day we will get to it. Usually, that day is called moving day. The time that you know you are downsizing or a job has taken you to another location is when you discover just how much junk you have managed to accumulate. Truly, most of it would have been welcomed by the Salvation Army or Goodwill. They still will have open arms for most of your junk, it is just now you will have many more trips to make. Or perhaps you think that you may have a yard sale and come up with a few extra bucks. Unless you have usable children items or some possible antique things, you will be lucky to come out with fifty to seventy five dollars and a lot of work pricing and staging the whole process. At this point, I would like to add that there is another place where junk can build up. Think about it for a moment. It is not material things; it is thoughts, ideas, facts, judgmental positions and even untruths that may have come your way through gossip and hearsay. Some things, yes, you may want to hang on to for future references. (This is what I use Google for.) My husband and I have this discussion often. He can rattle off so many trivia facts that I often ask him why does he hold on to this information? Make room for new and important stuff, like which store is having a shoe sale the next weekend. Let go of some of those preconceived ideas so that you can go into new relationships with an open and fresh mind set. Spring cleaning can come in many forms. If you have not connected the dots yet, please allow me to shed some light on the subject matter to help you. Traumatic events in the news causes spikes of stress in all of us. There is a significant influence on our mental health with repetitive showings of traumatic and violent clips and images that cause even further extreme reactions from some individuals. Media is blamed, however, consumers are equally responsible. We have the power to turn the knob switch to the off position. It has been proven that there is a biological instinct to pay close attention to potential threats however. obsessively researching traumatic events can eat away at our mental health to the point of not rationally thinking. The media can warp your world view if you allow it. To achieve a more holistic way of thinking is to focus on the good news such as medical advancements, peace in some parts of the world, good samaritan deeds, random acts of kindness, etc. This helps our brains to balance out all perspectives of our world. Look around you and you will see that the world is not falling apart and we are not going to hell in a handbasket, but the media would have us believe this to be true. The news can be and is violent, depressing and hateful as well as emotionally charged. All of this can mess with our heads. It is out there and we must acknowledge it in order to help stop it. Acknowledging it is not watching and listening to the same stories over and over. There is a difference. 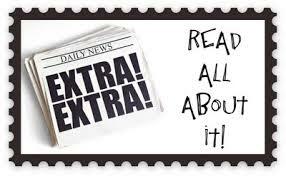 Negative news can significantly change our moods and our own personal concerns. It may affect how you interact and interpret the world around you. Definitely a more positive form of journalism would benefit us all. It helps us to become problem solvers and not another problem in the world. Sometimes it helps to turn off the TV and listen to the healing powers of music. When I put on my Pandora while working the other day, I found it interesting that a Simon and Garfunkel song came up called "The Only Living Boy in New York." As I listened to the lyrics closely I heard a line that said, "I get the news I need on the weather report." Hmmm! I thought to myself that is one way to handle the problem. Let's not oversimplify, however, we need to balance our media intake. Yes, find out what is going on in the world, by all means. No need to replay the events over and over and over again. Move on to a positive position, shake it off, as best that you can and learn how not to add and be a part of the drama. Social media such as Face Book, Twitter or others can do a person's head in if you allow it. There is such a thing as scrolling on down the page and humming to yourself, "Silence is Golden." Yes, your eyes will still see, yet if you focus on all negatives or events and ideas that bring your stress levels up then you are playing right into the drama. As an example, I did see in our news about how a positive idea was suggested and had many others jumping on that bandwagon. I thought to myself, there you go...work together to try to help unite communities. Only to later on see a well known journalist write about what kind of foolishness this was and she would not be a part of it. My words to that is that thank goodness we live where all can voice our opinions and have choices. Just as it is our choice to not take part in the negative impacts thrown our way every day. We have not only the right, but an obligation to move on down the road to help establish a more loving and caring, positive world. So, where will you get your news from? Today I read a statement that said a comfort zone is a beautiful place, but nothing ever grows there. I shared this as my daily personal mantra with others and received many statements about how true this really is. I even looked up some quotes on the comfort zone and was amazed to find many statements very similar to this one. Our comfort zones are beautiful places. We are happy and content being there, for the most part. For a moment, please think about exactly what that means. 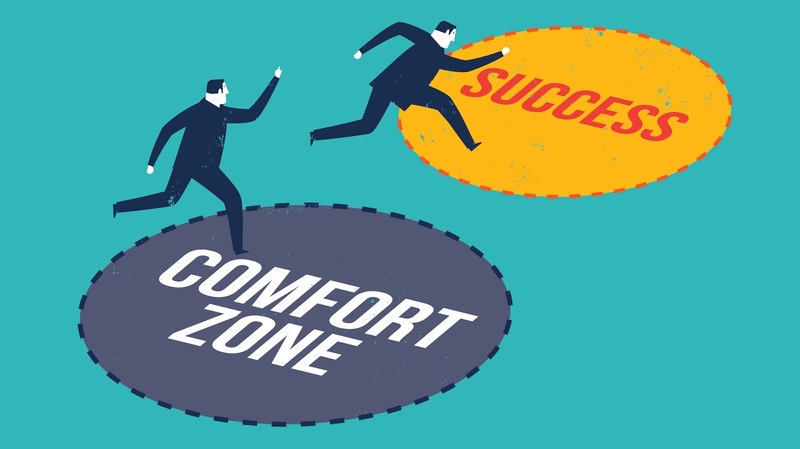 The most scientific definition of what a comfort zone is related to anxiety levels. Comfort zones will keep our anxiety levels relatively low. We are doing things that we know. Familiar activities such as watching TV, cooking the same recipe that we always have, or doing a job at work the same way that it always has been done. If traffic is in a frenzy and you must go a different route, this will probably take you out of your comfort zone and add anxiety to your day. A little anxiety is not always a bad thing, in fact, it can be very beneficial. Sometimes we need a little push to take us away from our comfort zone. What we need to watch out for is the panic zone. Step away from your comfort zone to your learning zone where everything is not familiar and you must learn some new skills and try to do things differently. If you go too far, the anxiety level will be too high and nothing new will get accomplished. Things in life don't always go our way so we must find peace in the learning zone in order to move ahead. Things are not always going to be in our little comfort zone space and if they were we would be quite boring. Just think of the people that you know. People naturally gravitate to those who have stepped out of their comfort zone because they are fun to be around. Uncertainty is what brings on anxiety and takes us out of our comfort zone. New things make us put up our guard and take more energy, therefore making it easier to remain in status quo. Whenever you mix some anxiety and self-doubt with personal feelings or success is when personal growth can take place and your confidence level grows. You will have a more exciting life because you are enjoying more things that life has to offer. Trying new things whether in your personal life or work life will expand your horizons and motivate you to do more and learn more. How far you want to push, in most instances, is your choice. In your work environment - not always the case. Changes can be dictated down to you and you then have the choice to embrace it or step out of the comfort zone to try something new or to be miserable and whiny. Go ahead and take a chance, just watch out - you may learn something new and like it. Liberating means inbound thoughts or behaviors are set free. In order to have the independence of thought it is a necessity in order to express creativity. Life can bring us down and there are times that we need help to lift us up again. Or, you could choose to be more pro-active and use music before you must have it to help bring your spirits alive again. Music can lift your spirits, encourage movement and alleviate stress and anxiety in so many ways. We can listen. create, sing or play music to enhance our moods. It is a positive for our minds, bodies and souls. This is why we have it in every room of our home. Music is almost always playing. It has been researched and shown that there are even times that music provides a more powerful impact on health than medication. Scientists are working on studies to find out the whys and hows of patients with dementia improve their memory as well as what impact music has on pain relief and stress. New studies are underway to prove if music may have an impact to augment immune response systems. In my words, music seems to be magical. Much more powerful than many realize and we should never underestimate the healing power of music. This is all very exciting, however, I am bringing this to your attention so that educators and workshop presenters can use music to help their students and audiences become more creative and even help to make the brain more receptive to deeper critical thinking. All you have to do is become aware of the music that is out there, download it and go with what you are trying to accomplish. Many songs are actually on the Internet matched up to what it is you want the music to accomplish. (example: Music for Teaching Math, Literacy, History, etc. or even Motivational, Transitional, and Introductory Music). Music creates a common experience whether in the classroom or a workshop, with Early Childhood children or with adult learners. It can make us smile, laugh, or cry. It manages the energy level of the room and can be used as a signal to transition from one activity to another. Some practical things to pay attention to as you plan your music are to be sure to expose your classes and audiences to all types of genres. It should not be a constant filler, as they need to hear their productive chatter, as well as the music which was playing for a specific reason. Notice and be aware of how the different types of music show many different types of behavior, depending on what you need them to be doing. The group can be listening quietly, singing along, humming the tune, playing the music with instruments if available and don't forget the kinesthetic learners who need movement when it is appropriate. If you are playing the whole song, it is a very good idea to have the words up and showing somewhere in the room. Just to give you a few ideas that are entertaining, depending on what you are teaching and what you desire from your audience think about beginning with The Rolling Stones song, "Start Me Up." That will get a group motivated! Also, to help the group know that they are doing just awesome, the song from The Lego Movie called "Everything is Awesome" would be a great energizer. Don't forget to introduce calming music that stirs creative minds, such as Vivaldi, Bach or Mozart. Music that many may not be familiar with such as acapella groups like Pentatonix and even a Scottish group known for playing popular rock songs with a few familiar instruments, but the mostly unfamiliar added touch would be the bagpipes. This group is called The Red Hot Chilli Pipers. It would be a great idea to show this group and music on YouTube if your room or stage is set up for that. The point is to just have a good time. Learning is fun and should never be boring. Music is most definitely liberating! Readers may take the picture above literally. 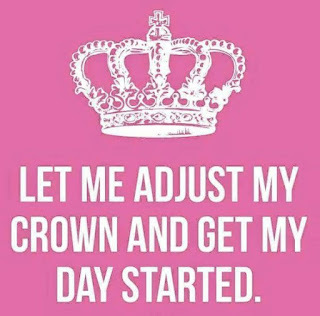 I know that I am writing it just in that manner, because there are many ways that each and every one of us can feel like a member of royalty. We each are responsible for our own happiness. In my own world, I feel very fortunate, in that I married my soul-mate, who against all odds, met in our 40's and moved to the same city a week apart from each other. For me it was a mere 8 1/2 hour move. For him, a British citizen, it was 4,283 miles away move. And somehow, we managed to meet in the months to come. Once we met and got to know each other, I traveled with him to England on different occasions to meet his family and friends. He always managed to find time to make me feel like a Queen by taking me through Warwick Castle, Winston Churchill's home, plays at West End theaters in London, as well as The Royal Shakespeare Theater in Stratford upon Avon. We visited the off beat city of Glastonbury, watched corny famous pantamines, tried to visit Queen Elizabeth at Buckingham Palace (she was busy), drove through Notting Hill (where I was on the look out for Hugh Grant) and shopped in little boutiques, as well as Harrods and Marks & Spencer department stores. You could never imagine my surprise at the difference in supermarkets, such as Tesco, versus our stores here in the States, and then their little specialty food shops which included the local butcher or baker. I am quite sure there was a candlestick maker shop somewhere along the way. If you had told me earlier in my life that I would share these kind of experiences, there is no way that I would have believed you. What these experiences have shown me is that anyone can live royally if this is what they desire. What it really is all about is choosing to be happy and staying positive wherever you go and whatever you do. We all are responsible for our actions and bringing a good attitude and a sense of humor with us wherever we go, whether it is to England or your place of work and home. In previous blogs, I have mentioned positive mantras and meditation. Some people think that I may have gone off the deep end. Actually, this is what restores me and keeps me from going off the deep end. Usually, I post a positive quote in my journal and on Face Book. It is one that I find or I know that it speaks to me that very day for what I may be facing. Sometimes others click that they like it or even have a comment. Others tell me face to face that they read my quotes daily, even though they never click like or make a comment. Either way is a wonderful compliment because I am putting the quotes up for me and if it helps someone else think about a positive mantra for their day - that makes me very happy. As for the meditation, I do not go and hide away for long periods of time, humming "Ohm" with my fingers and thumbs touching while holding them up in the air. I just find a quiet place, close my eyes and clear my thoughts by focusing on breathing. Let me share this with you. Currently, I am going through radiation therapy. It does not take long, about 10 minutes and once I am in my comfortable position, it is quiet, I close my eyes and cleanse my thoughts by focusing on my breathing. I have not gone to sleep, however, I have gone very deep into cleansing my thoughts and discovering peace while meditating. So deep, that the technician had to speak to me a few times repeating that I could sit up now, as well as touching my arm gently. I told her what I was doing and she seemed fascinated by how the powers of meditation worked and helped me find peace. And finding peace for me is what helps me to feel on top of the world, as I imagine that a Queen may feel. To follow up on "ME TIME," that I wrote about Wednesday, it is not being selfish; it is giving yourself the ability to deal with others in a more positive and thoughtful manner. 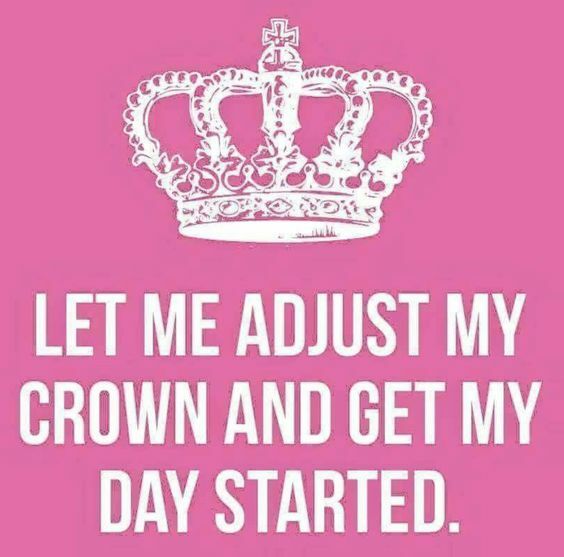 So adjust that crown and get your day started! Selfish? I Should Say NOT! Scientific studies have been around for a while stating the benefits of getting enough sleep. It improves health and helps to detox the brain by recharging your batteries. You must set specific times and stick to these times where there will be no work! Just you, which should include time with your immediate family and/or friends. The "just me" time needs to be set aside that does just exclusively include you. It should be a time for meditation where you can visualize and become more aware of what you are grateful for throughout your day. It helps you to put things into perspective. Focusing on breathing is very important during this time, as well as ending it on a positive note of clearing your thoughts while being mindful of your breathing. Some even find writing in their journal daily helps them to visualize and become more aware of their day and then to sit quietly and meditate with as few thoughts as possible, except for the sound of your breathing and perhaps repeating a positive mantra. This can be accomplished with some yoga added in for good vibes. Why is it so difficult for many of us to do this self-care routine for ourselves and if we do manage to make it happen then why do some of us feel guilty about doing it? We all must get over the guilt and seek ways to improve our health and well being. 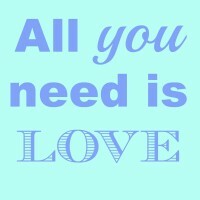 Give yourself the gift of love! As a matter of fact, I am going to make a call just as soon as this blog if published for a facial. Along with detoxing my face, I am going to make myself the pledge to take better care of me. That means, penciling in myself on my calendar of my "me time," whether it is a bubble bath, reading a good book or browsing through a magazine, exercise time or making myself go to bed earlier so that I am more alert the next day. Of course, it would not be my blog without quotes, and the one that comes to my mind is from E. E. Cummings when he said, "It takes courage to grow up and become who you really are." Let's not allow others to define us. Seeking outside validation does not work. We need more than that to become better and healthier human beings. Being in touch with your own feelings and what you need in order to have "me time" comes from your own internal validations. Get lots of rest - Napping has been proven to change your brain into ways where you become more creative. It has been researched that the human body is actually designed to have two sleep times a day, one at night which is longer and a shorter one after lunch. Daytime napping is common in many other countries around the world. In China, after lunch, many companies encourage employees to put their heads down at their desks for a power nap. This stirs the brain to more activity. Sing in the shower - This is a very creative way to express yourself musically, even if you can't carry a tune. No one is going to hear you except your significant other or child. Even if you don't know a popular song, it is okay to just sing out loud the ABC song or a nursery rhyme such as Twinkle Twinkle Little Star. Change the version and tunes now and then. What a wonderful way to start your day or end your day! Try it before you cast the idea aside. Get away from the computer and other technology - Instead of typing your notes into some gadget, try writing or sketching your ideas in a notebook that you carry with you at all times so that you can make lists or draw what is on your mind while waiting vs. checking face book postings or texting. Allow yourself to make mistakes and stop beating yourself up over what is already done - Making mistakes is only fatal if you do not learn from them. Berating yourself is not going to make it better. Pick yourself up and get back in the race with another go at it. Giving up is the direct route to failure. Collaborate - get feedback from others and surround yourself with creative people. 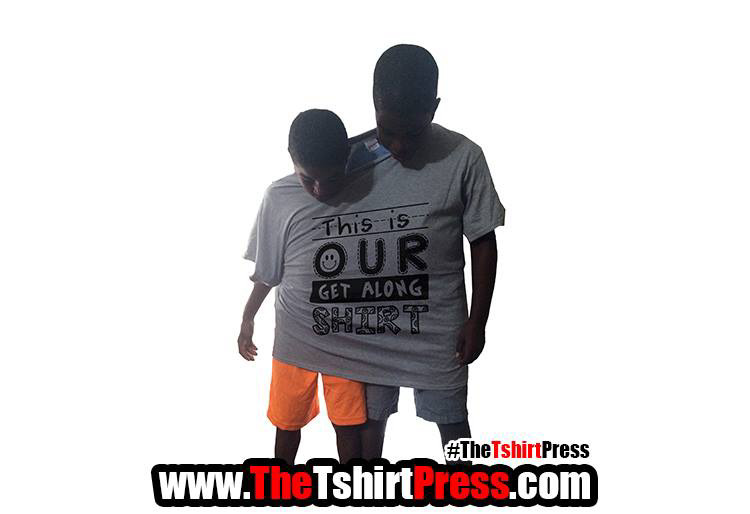 Their feedback and collaboration will help you see other sides to problems and solutions. Keep an open mind. Have fun and take risks - such as going to a new place. This can be as local as a new restaurant with a different cuisine from what you are used to having or an actual trip to a new destination. It has also been proven that people with multicultural experiences are more creative. Once you stop trying to be someone else's idea of perfect, you will be able to let yourself be the real you. This does not need to be forced, just let it happen gradually as you practice some of the ways listed above and probably some that, hopefully, I made you think of for yourself that may work for you. Being creative is a personal thing. Being creative means solving a problem in a new way and the way you get there is by taking risks and ignoring doubts and facing fears. It is doing something different for the sake of doing something different because the old way is just not working. We can choose to do the same thing the same way and get the same results or we can shake things up a bit and have more fun. Which would you prefer? Our children and grandchildren of today have amazing technology at their fingertips and they know how to use it, many times, better than some adults. When I think back to my own children growing up with new technology coming out all of the time, never did I dream that their children would be so much more further advanced in technological skills as they are. In 1986, the old Commodore 64 computers were out. We had one at home for the family and the school district where my children attended school had just put one in each classroom so that the teachers could send attendance reports and lunch counts to the office daily. They could do other tasks on their school computer such as lesson plans, sending e mails to parents, or other features that were available at the time. My son was 6 years old. His teacher was flabbergasted at the whole idea of having a computer in the room. 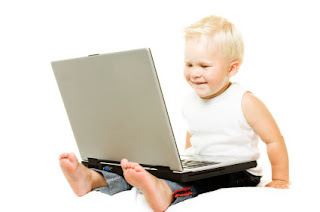 One day my son bravely asked her if he could show her something on the computer and when he did, she was amazed at what he knew. In no time at all, he was sending the daily attendance and lunch count to the office. She did ask my permission if it was okay to have him spend a little time doing this job. I agreed, after all she had to work very hard to keep him challenged and this was one way to help her. Now when I think it is 30 years later and we actually do still have some adults who can't complete basic skills on the computer, yet we have toddlers and even some who are barely toddlers knowing how to play educational games with scrolling up and down and left to right, how to take pictures, including selfies and how to Face Time their grandparents, aunts and uncles? There is no stopping their love of technology because they are not aware of the "good old days." They have such a desire to learn, that it is simply a natural instinct in many of them. These "good old days" that I spoke about would be the days that I would be pouring over World Book Encyclopedias to try to research information for school reports or for just the sheer reason to have an answer to a question that I had. Now this information is at their fingertips on Google and other sources from the Internet. If they have a question that they want answered, immediately with a click on a smart phone or tablet, the answer is right in front of them. All educators need to be aware of this. Perhaps, this is why some children have trouble with the sit and get style of teaching. They are used to searching for themselves. They know how to problem solve using technology and teachers' roles need to change so that they are the facilitators of getting the knowledge instead of feeding it out. Another personal example is when my granddaughter went with her mother and father to see the ultrasound picture of her baby sister. When the technician showed her the head and the arm of the baby, this 4 year old said, "Isn't she so cute?" Then she replied, "I used to be in there, too." When is the last time that you ever heard the old stork delivery story? Okay, so I did not try to feed that story to my children either, yet they were not looking over ultrasound pictures, as they were an emerging technology and extremely hard to see anything clearly. For two years now, this same granddaughter has used my IPhone to sing songs, plays ABC games, connect the dots, look over pictures of herself and even take selfies. She used to ask for the code to get in to the phone. She now knows it by heart. And of course, I always have an game icon just for her to go to for her pleasure. If it is not someone's IPhone, then she is talking to the Amazon Alexa. She will have a full conversation with this tool, telling her what song she wishes to hear, or for it to tell her a joke. Woe be it if Alexa did not understand her words, because this little girl will tell her that she is not listening. It is rather amazing to be a witness of these kind of conversations. I don't think there will be a 21st century breakdown as predicted in one of Green Day's songs. The children of the 21st century have technology all around them and they intuitively know how to use it. All they have to do is take advantage of it. There are tricks to folding fitted sheets. I, for one, can never get those tricks right. I just use a tried and true method that my mother showed me many years ago. Fold the fitted sheet as best as possible, fold the pillow cases, then stack those in the middle of a nicely folded flat sheet and wrap like a present. No one can see the mess in the middle. Whatever works, is what I say! Speaking of tricks...this blog is really not about folding fitted sheets. I ran across a quote that I could not find attributed to anyone in particular. "Talking to some people is like talking to a fitted sheet." To me, this meant it could be very frustrating for one of two different reasons. The first reason is that the person you are trying to talk to is very shy and quiet. If you get the honors of being placed with this person at a dinner function or some other get together, there are some tips to help you out of an unpleasant situation. First of all, don't take their quietness personally, nor comment to them about how quiet they are. There is no need to draw attention to their shyness. Some people just need a little time to warm up to others. Actually, I have known people who were mistaken for being "snobby" because of their shyness. That is usually never the case. They are painfully shy and it is as uncomfortable for them as it is for you. If you try to take the lead in the conversation, they may reciprocate and then again, they may not. Sometimes the best thing to do is to back off and give them their space. There is a fine line of how much time they may need to gather their thoughts if they are going to respond. A bit of silence is okay up to a point. If you feel it is making the other person feel even more awkward, it would be okay to step in and give your own response just to save them from embarrassment. The other type of person that can be even more difficult to talk to is the person who never lets you get a word in edgewise. This person can actually ask you a question and before you can utter a syllable, they are spewing out their take on their own question or thought, and then some. This type of person usually has what psychologists describe as a problem with loneliness or insecurity or perhaps just plain arrogance. They need social interaction to survive. There are some strategies to use depending on where you are and when the yakaholic goes into a talking frenzy. At work, if it is in passing, you can keep walking, explaining that you are late for a meeting that you must attend. Let them know that they may need to send you an e mail and you will get to it when possible. If this type of chatterbox is a friend that you still desire to do activities with, then choose activities where no talking is allowed, such as a workshop, an exercise class or a movie. If at home, multi-task while they yak, so that you feel as if you are not wasting time - this is a win-win situation. You are not getting frustrated by not getting things around the house accomplished and they are getting their needs met by yakking it up to you and sharing their thoughts. There is such a fine line in toning down the chatterbox to keep your sanity. Try giving one word or a phrase as an answer. Or just smile and nod, then change the topic quickly to throw then off balance some. Try not to be alone with the talker. Go in pairs or have a standing cue to help each other out of an unwanted lengthy conversation. There is really not a right time to just use the words, "Shut up!" It may be sounding off loudly inside your brain, but that is where it needs to stay. Be strong! There is nothing wrong or inappropriate to say that you are sorry but you are not in the mood for talk right now. There is one positive out of being around a chatterbox. An old Russian proverb stated, "A chatterbox is a treasure for a spy." You can learn a lot from one and even get ideas for writing articles, blogs, and books. Just stop and listen now and then. You could find yourself quite surprised. As all parents know, there is no instructional manual that comes with children. There are plenty of books with ideas to use and try, just not one set of guidelines to go by, for the most part. Lots of ideas come from other parents who tried out a creative idea that worked. Will it work on your child? Maybe. Maybe not. Every child has their own personality. There are certain guidelines that do work from day one. Simple ones actually, such as you are the parent, they are the children, therefore there is no room for arguments. To take that to a different level, is that there is room for talking calmly and setting boundaries, so that the child feels as if they were allowed to make a choice, even though it was basically what you wanted them to do all along. Example: family dinner time and all are sitting, except the toddler who wants to be up playing and perhaps pop over to the table to grab a finger food to be off on his way. This is the time to go the child on their eye level and say calmly, yet firmly, "You have a choice here. You can go off and play by yourself without disturbing us, which means you will stay away from the table where we all are eating together, or you can come and join us and sit down to be a part of the family. Then walk away. Most of the time, the child will get up to be a part of what he wants to be a part of in the first place. 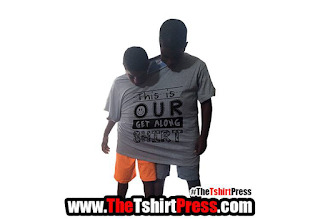 If you looked at the picture above of two brothers wearing one large t shirt that says, "This is our get along shirt, to wear if arguing and fighting over toys and TV continues, this is a creative way to use time out with both children having to talk out their differences and come up with a solution. It teaches problem solving. Set a timer and let them sit down and talk. There is actually a company who makes these shirts, however, one of a dad's old t shirts with the words painted on it will work just fine. Time outs are used, yet time ins work well also. The child is placed in a designated area with a task to complete. Depending on the age of the child, it can be to string a yarn with 50 beads, trace the alphabet, put together a small puzzle... and it is important to set a timer. Then, after the frustration has worked out of their system, you can discuss the problem and they can help with the solution or what they could have done. They are told to think about it while they work. A favorite of mine is the messy room syndrome. For a child who still has the Tooth Fairy coming to visit, if timing is right, you can leave a note from the Tooth Fairy to the child that says she came to retrieve her tooth and to leave a payment, however, the floor was covered with toys and clothes and she had a hard time getting to the bed. She does say in her note that if the child organizes her room, that she will try to make a return visit. Amazingly, a clean room without all of the hassle should be the outcome of this method. One tried and true messy room idea is to set a deadline of when the items can be picked up and put away. If the deadline is not met, go into the room with a plastic garbage bag and start loading the bag. The child is delighted to see that someone magically cleaned the room for her; until she is looking for something that she wants to wear and it is not to be found. When she asks for it, you tell her that it is in a bag and will cost a dollar to get it out. (set your monetary limit based on their piggy bank/weekly allowance). This is a great way, especially for pre-teens, to learn the value of keeping their rooms picked up. In the world of wi-fi and what our children can amazingly do with it, a method that I never got to try out, but have been told it works very well is to place a sign on the family computer. If they have a smart phone or tablet, the wi-fi word is changed and therefore no internet connection until chores have been completed. Another example of using today's technology is to remind your child of their jobs before you go out shopping. Text them in a while to ask if they finished unloading the dishwasher. When there is no reply, ask if they finished their homework. Again, there will most likely be no reply. After a few reminders, text that you are looking at cars so that he can have his own. You will get an immediate response, something like, "Oh wow, Mom. Thanks!" To which you reply, "No - I'm not. Just checking to see if you are reading my texts." Tricky, but effective. Last suggestion that I know for a fact that works. When it comes to rather delicate conversations that you must have with your child, try having them in the car while driving down the highway or interstate. First of all, they do not have to have eye contact with you, which can make them very uncomfortable and no one is going anywhere. A perfect example of a discussion that you may want to plan this way could be on the birds and the bees. I can promise that you won't regret it. They may at first, but they will get over it. At least they heard what you needed them to hear. There is no one way to raise a child. It is by trial and error, and hopefully, what you choose works most of the time. If not, try a different approach. Each child needs the love, affection and guidance from their parents. It is not up to anyone else to give these basic needs to your child. HAPPY CREATIVE PARENTING! Brothers mean a lot of different things to those of us who have one. And to those who have more than one, probably each brother has his own special place in your heart. Each one is an individual. I am pretty sure that my Mom was glad that 5 years after having me, she only had one more child, my brother, because the two of us, without purposefully trying, gave everyone a run for their money, lots of laughs and definitely a bit of frustration. Being the only child for 5 years, and then all of a sudden having a baby brother was a shock to my system. It is true that the older sibling believes that the baby gets all of the attention. This is no reflection on parenting skills...it is what it is! Let me paint a picture for you. Here is a prissy little girl, who loves to dress up and be the center of attention wherever she is taken and most definitely was just that for five years! (that would be ME) Then along comes this baby boy, that the nurses at the hospital have even nicknamed Little Elvis, due to the fact that he was born with loads of black curls all over his head. Actually, so many that he was close to a haircut to keep the curls out of his eyes. The baby is brought home and again, no matter where we went or who came to our home to see him, it was all about Little Elvis. After a few weeks, this prima donna decided to do something about that. Very carefully, when he was napping and no one was around, I managed to get a pair of scissors and reach into the crib to cut those curls off. Luckily, the only thing I cut was hair. There was no blood. However, I can tell you there was a bit of pain involved and a lot of crying. It was not from Little Elvis. Our Mother was the one crying because all of the curls were gone. I was the one crying because of the spanking that I received. There were never very many spankings in our household for either one of us, however, this time there was. Obviously, I still remember it to this day! Once I realized that this little brother was going no where, I finally accepted him. There was a big enough age gap that he had his world and friends and I had mine. We were together at family times basically, and together when the kids in the neighborhood were out and about. We both played with them. Sometimes we were partners in crime, such as hiding out when the porch light came on, which meant time for us to come home. We managed to add a little more time to playing by finding good hiding spots together. We shared a story the last time we were together about when he was maybe 8ish and therefore I was 13. Why he decided to stick a metal knife into the electrical outlet at the kitchen island bar is beyond me. I watched before I screamed out in pain, because I was getting shocked by holding onto the metal rim around the kitchen island. He was looking at me as if I were crazy. Our Mom quickly knocked it out of his hand to stop the electricity going through to me. No one in the family was then or is now an electrician. Why he did not get shocked, who knows? Just chalk it up to another brother/sister story. As teenagers, it was on again as best friends and then off again to keep your space and stay away. He was there to take me out in a boat to go frog gigging, of all things. Those who know me probably are having a hard time believing this. Trust me, it was only once. Outside and wildlife was really not my thing. He came home with a raccoon that he captured but I caught him with this critter as he was hiding it in our attic. He begged me not to tell our Mom. It was a baby one and I stayed quiet for a very short time. I think I started to get worried that he would get out of the cage and come in my room. So, of course, as big sisters do, I ratted him out. Through teen years, especially, it was always a hot and cold brother sister relationship. One moment we are best friends and would do anything for one another and the next moment we would barely be speaking. Luckily, for the most part it was a lot of best friend moments. Through my careful planning, he even helped me get rid of a boyfriend once. Yes, I know this was a cruel thing to do to both of them. But my best friend did it just for me. Our memories will always be there. Now I can't imagine life without him. We don't get to see one another often due to the fact that he works in Scotland. As we get a little older and able to travel more, we are hoping this will turn around and visits will become more frequent.